I have never hosted a potluck before. We’ve done summertime bring your own meat style BBQs, but never a true potluck. At first I was excited about the idea but then as the date grew closer I started to get nervous. I called my mom, who takes part in this rotating monthly potluck dinner club thingy and asked her for potluck tips. “That’s it?” I asked, hoping for some brilliant potluck insight. “Yep, that’s it. We’ll be there. see you Sunday!” she said cheerfully as she hung up on me. Hm. I was hoping for something a bit more insightful. Still, her lack of tips actually calmed me down a bit. This potluck thing must be simple, right? Easy even? The Sobeys website, betterrfoodforall.com, has a Potluck Inspiration section full of tips. 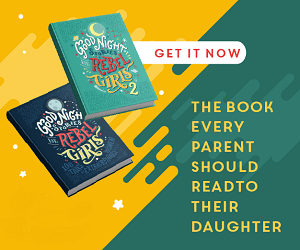 Thinking the website might have something more useful to tell me than my mom did, I took a second look and read through blog posts on How to Potluck with Your Kids and Your Ultimate Potluck Checklist. One of the big tips on the Sobeys page was to have a theme. I had already decided the theme for our potluck would be games. The idea was to get together play some board games, have a shared meal, and then quite likely play some more board games. I briefly flirted with the idea of making board game themed food. 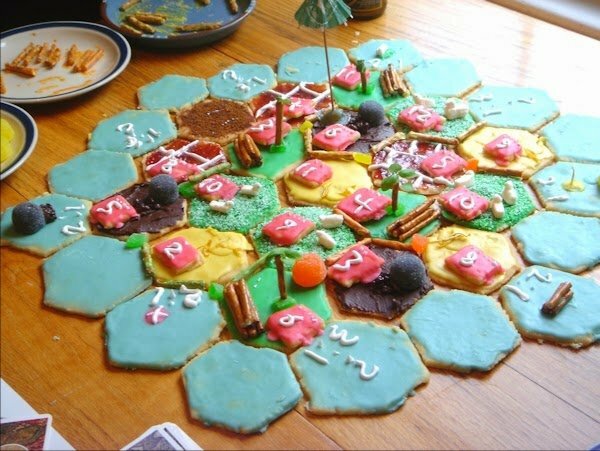 Cookies of Catan? Meeple shaped burgers? Cute, but that sounds like a bunch of extra work. I’ll be happy if I can get the house clean in time for the party. Cookies of Catan? Yeah, it’s been done. The other big theme for our potluck was that the dishes needed to be gluten free. One of the kids attending was just recently diagnosed with celiac disease. His parents said they’d be more then happy to bring special food for him, but given that my mom suffers from the same thing I thought it just made sense to go with a gluten free menu. Given that the entire purpose of the potluck was to take part in Sobeys Potluck Challenge for Food Revolution Day, and the point of Food Revolution Day is to get kids excited about eating fresh food and cooking from scratch, I decided to get the kids involved in the planning phase. We sat down together and browsed through the recipes on the Sobeys website. I will admit I did think about cooking an old favourite, but decided that trying out new recipes was more in keeping with the whole learning about food theme of Food Revolution Day. The kids helped me pick out two recipes to make, Big-Batch Shepherd’s Pie and Almond & Olive Hummus. We decided we would pick up veggies for gluten free dipping, as well as some whole wheat pita for those who could indulge in grains. Then the six year old helped me make our grocery list and check the kitchen to see what ingredients we already had on hand. I love how excited the girls are about this upcoming party. They are in giddy count down mode and keep prattling on about everything from the fact that other kids are coming over, to the fact that they get to help with the cooking. As I was writing this post the four year old was making suggestions on what I needed to say about our potluck party planning. “You should write ‘It’s yummy. '” I corrected her and said I can’t write that because we haven’t tasted it yet. She insisted, “You should write it because I know it’s going to be yummy.” And I love that attitude, that I already know I’m going to love the food because I helped you pick it out attitude. Just what we’re trying to inspire here, right guys? In honour of Food Revolution Day Sobeys is challenging Canadians to come together for Canada’s biggest potluck party and they are donating $1 to the Children’s Aid Foundation “Cooking for Independence Project” for every potluck photo shared online via Twitter or Instagram with the #PotluckChallenge and #FDR2014 hashtags. Today May 16th is the last day to take part in this fund raising campaign. Get to it folks! Plan a potluck, host a potluck, or attend a potluck and share those potluck photos online via Twitter or Instagram with the #PotluckChallenge and #FDR2014 hashtags. 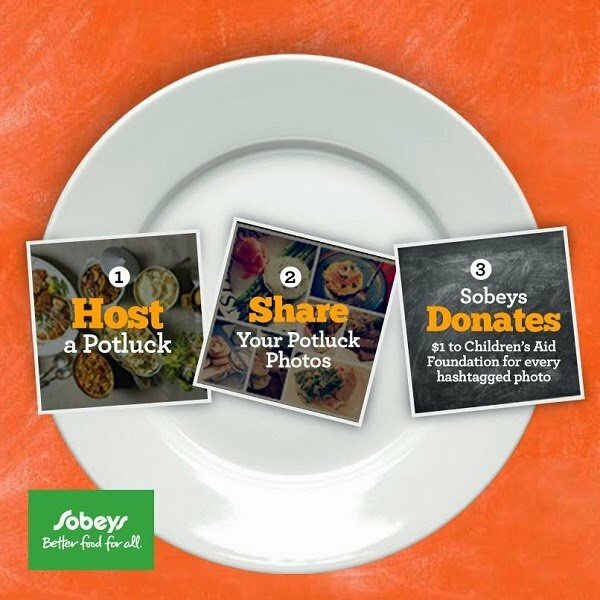 For each photo shared Sobeys will be donating $1 towards the Cooking for Independence Project, which aims to set up workshops across Canada to teach kids how to cook their own healthy meals. What about you guys? Like me do you feel a little intimidated at the idea of hosting a potluck? Are any of you taking part in the Potluck Challenge? or doing anything else special for Food Revolution Day?